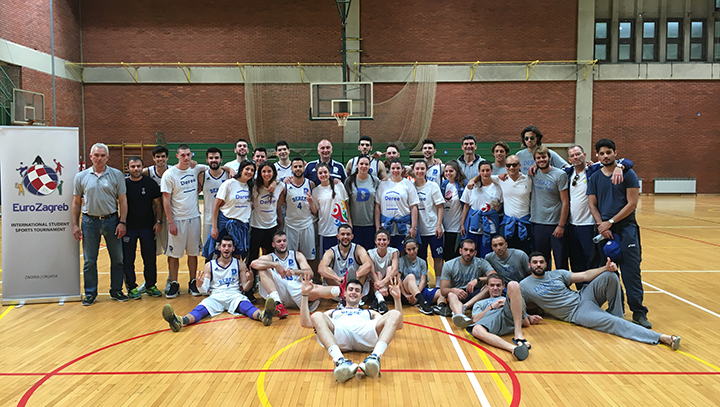 The Deree Men and Women basketball teams flew to Zagreb, Croatia, to compete in this year’s EuroZagreb International Student Tournament, held on May 24–28. The Deree Women’s and Men’s Basketball teams participated successfully, earning gold medals! The Men’s Basketball team led the way to the first place, after playing against the Zaprešić University of Applied Sciences, in the semi-finals with the Zagreb School of Economics and Management, and in the finals with the Libertas International University. Following a rough start to the tournament, our Women’s team had a spectacular performance in the finals, resulting in winning the Women’s Basketball team of the Zagreb Faculty of Chemical Engineering and Technology, and won the gold medal! Our Men’s Water Polo team, also participated in the tournament, finishing in fourth place in a very competitive tournament. With one win against the Zagreb Faculty of Economics and Business, and two losses against the Zagreb Faculty of Science and the Faculty of Mining, Geology and Petroleum Engineering. As the tournament’s best delegation, Deree was awarded the EuroZagreb 2017 Faculty Cup! Our Men’s Soccer team and Women’s Volleyball team participated in the Best Belgrade Sports Tournament 2017, held on May 17-21. The Men’s Soccer team won third place after losing the first game to DIF, Serbia, and won the second game against GUST. In the semi-final our team lost to FON, Serbia, and won the Serbian team ‘Rekreativo’, which placed them in the third place. Our Women’s Volleyball team, currently in a rebuilding process after four extremely successful seasons, lost the games against FON, Serbia, the Faculty of Philology, Serbia, and the Faculty of Economics, Serbia.